Holiday trees decorated with handmade 'Critter' ornaments are an annual highlight of the exhibition. "A Brandywine Christmas" offers visitors of all ages a spectacular holiday experience including a gallery filled with a large model train display, towering holiday trees decorated for the season with “Critter” ornaments, and a wide selection of holiday events and programs the whole family can enjoy. The annual celebration opens on Nov. 24 at the museum in Chadds Ford. The model train display, a holiday family favorite since 1972, offers scale model trains made by Lionel, Williams, Atlas, Mike’s Train House, K-line and others. With more than 1,000 pieces – including locomotives, passenger and freight trains, and trolleys, all moving along 2,000 feet of track – the annual holiday exhibition is one of the largest modular model railroad installations in the world. 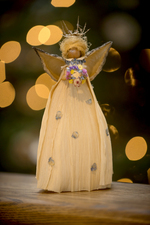 A 'Critter' angel, made with natural materials by museum volunteers. Critters are ornaments and tabletop decorations that are handmade using natural materials. Each Critter has its own unique personality and expression – no two are exactly the same. From whimsical animals to angels and stars, Critters come in all shapes and sizes. Using their imaginations, the Critter-maker volunteers work with natural materials such as pine cones, acorns, egg shells, flowers and seed pods to give each Critter its own unique personality and expression. Brandywine volunteers have been creating Critters for more than 40 years, with all proceeds benefitting the Volunteers’ Art Purchase Fund and Art Education & Programming. The annual public Critter Sale starts on Nov. 30 from 5 to 9 p.m. and continues on Dec. 1, 2, and 3 from 9:30 a.m. to 5 p.m. Critters will also be for sale in the museum gift shop from Dec. 4 top Jan. 7 while supplies last. Sundays, Nov. 26, Dec. 3, 10, 17 and 31, 1 to 3 p.m.
Thursday, Nov. 30, 7 to 8 p.m.
Children are invited to wear their pajamas as they delight in the tale of “The Polar Express” and enjoy hot chocolate and cookies. Tickets are limited. $15 for adults, $8 for children; $6 for members -- includes museum admission. Wednesday, Dec. 6, 6 to 8 p.m.
Visit with Santa and Mrs. Claus and enjoy entertainment, costumed characters, face painting, model trains, antique dolls, trees adorned with hundreds of Critter ornaments, and Cookie Land. $15 for non-member adults; $5 for non-member children ages 3 to 11; $12 for member adults; free for member children and children under age 3. The huge operating model train layout features detailed scenery and local landmarks. Join a behind-the-scenes visit with the Brandywine Railroad. Discover how the extensive layout is created and the complicated multitasking it takes to keep everything running. This before-hours event includes a private tour of the trains in action with Brandywine Railroad engineers, including special activities for the youngest train fans and a continental breakfast in the Millstone Café. Children will receive a Brandywine Railroad souvenir; ages 3 and older accompanied by an adult are welcome. $20 for members; $25 for non-members. Saturday, Dec. 9, 11 a.m. and 1 p.m. Sing along as Rick Spencer presents familiar Christmas tunes from the Victorian age such as “God Bless Ye Merry Gentlemen” and “Here we come A-Wassailing.” Folksinger and composer Rick Spencer is known for his performances of music in the American folk tradition. Included with museum admission. Tuesday, Dec. 12, 2 to 3 p.m.
Donna M. Beech performs selections of Ann Wyeth McCoy’s music on piano. Included with museum admission. Saturday, Jan. 6, 2018, 8:30 to 9:30 a.m. 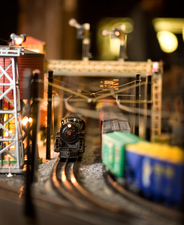 Enjoy early access to the museum’s Brandywine Railroad display during this accessible program designed for visitors on the autism spectrum or with sensory processing disorders. Space is limited and registration is required. Free museum admission. See the Brandywine Railroad and create a colorful train to display at home. Included with museum admission. The museum is open daily from 9:30 a.m. to 5 p.m. (except Thanksgiving Day and Christmas Day), and is on Route 1 in Chadds Ford. Admission is $18 for adults, $15 for seniors ages 65 and older, $6 for students and children ages 6 and older; free for children 5 and younger, and Brandywine Conservancy & Museum of Art members. For more information, call 610-388-2700 or visit www.brandywinemuseum.org.